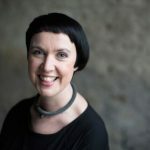 Angela O’Kelly has worked as an educator in design and applied art craft since 1999, as a curator of contemporary design and craft since 2004 and has also worked as a consultant, facilitator and practitioner. She most recently curated ‘Shape the Future’ for the Design and Crafts Council of Ireland, ‘Fresh Talent’ and co-curated ‘Liminal’ which toured as part of the Irish Design 2015 exhibitions programme. Her creative jewellery work can be seen in many private collections and the public collections of the National Museum of Ireland; the British Crafts Council, London; the Museum of Scotland, Edinburgh; the Museum of Art and Design, New York; the Cleveland Arts Centre International Jewellery Collection, UK; and the Office of Public Works, Dublin. She is currently the head of Design for Body and Environment at the National College of Art and Design, Dublin.